This article is about an association football (soccer) referee. For an American football referee, see Official (American football). In association football, the referee is the person responsible for enforcing the Laws of the Game during the course of a match. He or she is the final decision-making authority on all facts connected with play, and is the only official on the pitch with the authority to start and stop play and impose disciplinary action against players during a match. At most levels of play the referee is assisted by two assistant referees (formerly known as linesmen), who are empowered to advise the referee in certain situations such as the ball leaving play or infringements of the Laws of the Game occurring out of the view of the referee; however, the assistant referees' decisions are not binding and the referee has authority to overrule an assistant referee. At higher levels of play the referee may also be assisted by a fourth official who supervises the teams' technical areas and assists the referee with administrative tasks. 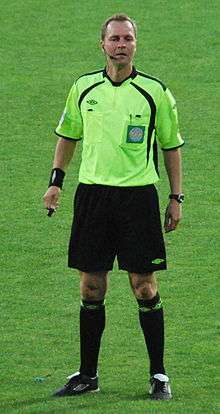 Referees' remuneration for their services varies between leagues. 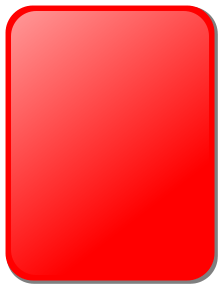 Many are wholly amateur, some may be paid a small fee and/or expenses, and in some countries a limited number of referees – mainly those officiate in their country's top league – are employed full-time by their national associations and receive a retainer at the start of every season plus match fees. taking action against team officials who fail to conduct themselves in a responsible manner and may, at his discretion, expel them from the field of play and its immediate surrounds. As per Law 9 of the game (Ball in and out of play), if during the game the ball hits the referee (or an assistant) there is no stoppage in play. However the officials would be expected to position themselves such that this would be unlikely to occur. Henning Jensen, Danish referee in October 2011. Modern day referees and their assistants wear a uniform consisting of a jersey, badge, shorts and socks: until the 1950s it was more common for a referee to wear a blazer than a jersey. Traditionally that uniform was almost always all black, unless one of the teams was wearing a very dark jersey in which case the referee would wear another colour of jersey (usually red) to distinguish himself from both teams. 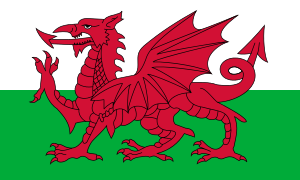 At the 1994 World Cup finals, new jerseys were introduced that gave officials a choice of burgundy, yellow or white, and at the same time the creation of the Premier League in England saw referees wear green jerseys: both changes were motivated by television considerations. 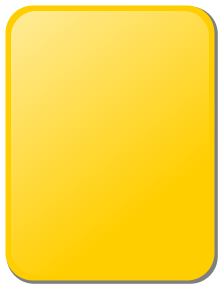 Since then, most referees have worn either yellow or black, but the colours and styles adopted by individual associations vary greatly. For international contests under the supervision of FIFA, Adidas uniforms are worn because Adidas is the current sponsor. FIFA allows referees to wear five colours: black, red, yellow, green and blue. 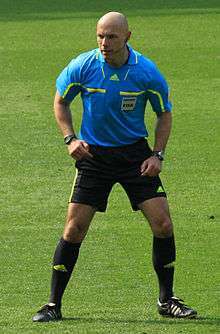 Along with the jersey, referees are required to wear black shorts, black socks (with white stripes in some cases), and black shoes. The badge, which displays the referee's license level and year of validity, is often affixed to the left chest pocket. All referees carry a whistle, a watch, penalty cards, a data wallet with pen and paper, and a coin for determining who gets the first kick-off in each half. Most are encouraged to have more than one of each on them in case they drop a whistle or a pen runs out and so on. Often, referees utilize two watches so that they can use one to calculate time lost for stoppages for the purposes of added time. At the highest levels, referees wear a full duplex radio with customised headset to communicate between each other and assistant referees use electronic flags, which send a signal to the referee when a button is pushed. In matches with goal-line technology, the referee will have on their person a device to receive the system's alerts. Referees use a whistle to help in match control. The whistle is sometimes needed to stop, start or restart play but should not be used for all stoppages, starts or restarts. FIFA’s Laws of the Game document gives guidance as to when the whistle should and should not be used. Overuse of the whistle is discouraged since, as stated in the Laws, “A whistle which is used too frequently unnecessarily will have less impact when it is needed." The whistle is an important tool for the referee along with verbal, body and eye communication. Before the introduction of the whistle, referees indicated their decisions by waving a white handkerchief. The whistles that were first adopted by referees were made by Joseph Hudson at Mills Munitions in Birmingham, England. The Acme Whistle Company (based at Mills Munitions Factory) first began to mass-produce pea whistles in the 1870s for the Metropolitan Police Force. It is frequently stated the referee's whistle was first used in a game between Nottingham Forest and Sheffield Norfolk in 1878; however the last such fixture known to have taken place between the two clubs was in 1874. The Nottingham Forest account book of 1872 apparently recorded the purchase of an “umpire’s whistle” and in 1928 an article by R M Ruck about his playing days in the early 1870s referred to the use of a whistle by umpires to indicate an infringement. The whistle was not mentioned in the Laws of the Game until 1936 when an IFAB Decision was added as footnote (b) to Law 2, stating "A Referee's control over the players for misconduct or ungentlemanly behaviour commences from the time he enters the field of play, but his jurisdiction in connection with the Laws of the Game commences from the time he blows his whistle for the game to start." In 2007, when IFAB greatly expanded the Laws of the Game Additional Instructions section, a full page of advice on how and when the whistle should be used as a communication and control mechanism by the referee became available. 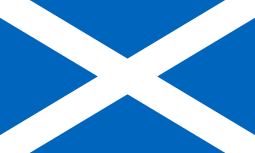 Referees in football are first described by Richard Mulcaster in 1581. In this description of "foteball" he advocates the use of a "judge over the parties". In the modern era, referees are first advocated in English public school football games, notably Eton football in 1845. A match report from Rochdale in 1842 shows their use in a football game between the Bodyguards Club and the Fearnought Club. In the early years of the codified sport it was assumed that disputes could be adequately settled by discussion between gentlemen players who would never deliberately commit a foul, however as play became more competitive the need for officials grew. Initially there existed two umpires, one per team, who could be appealed to with the referee (the game's timekeeper) being "referred" to if the umpires couldn't agree. The promotion of referees to the dominant position they occupy today, and the reformation of umpires into the linesmen role, occurred as part of a major restructuring of the laws in 1891. The diagonal system of control is the predominant system of positioning and division of responsibility used by football match officials throughout the world. It is the only system authorised by the Laws of the Game. First, the two assistant referees are instructed by the referee to each patrol half of a single touchline on opposite sides of the field. For example, on a field running north-south, one assistant referee (AR) would run on the eastern touchline from the north goal line to the halfway line, while the other assistant referee would run on the western touchline from the south goal line to the halfway line. In general, the assistant referees' duties would be to indicate (using their flags): when an offside offence has occurred in their half, when a ball has left the pitch, and if a foul has been executed out of the view of the referee (typically in their quadrant of the field). Generally, the ARs will position themselves in line with either the second to last opponent or the ball – whichever is closer to the goal line – to better judge offside infractions. However, the assistant referee will have specific positioning with respect to corner kicks, penalty kicks, and throw-ins. The referee patrols the length of the field to cover the ground not covered by his two assistants, generally running in a diagonal pattern from the southeast quadrant of the field towards the northwest quadrant; hence the term "diagonal system of control". Note that this pattern is not a specific route but a general guideline that should be modified to the style of play, nature of the game, the location of play at a given time, etc. In some cases the referee may even exit the field if it aids in his decision-making ability. The main idea is that the referee and assistants using the DSC should be able to position themselves quickly and easily to observe the important aspects of play (offside, ball in or out of play, goal-scoring opportunities, challenges for the ball) from multiple angles with multiple sets of eyes. Note that the description above refers to a left diagonal system of control, known as "running a left" or "standard diagonal". If, before the match, the center referee on this field decides to run from southwest to northeast, then the assistants must position themselves accordingly and the result will be a right diagonal system of control, otherwise referred to as "running a right" or "reverse diagonal". In many cases in the UK, referees now use more of a 'curve' based on a line running from the edge of the 18 yard box, and when near the centre circle they then curve to a line level with the other 18 yard box line. This is similar to the diagonal system, but with the speed of modern football it is easier to keep up with play. In international matches the left-wing diagonal shown above has been universal since the 1960s. It is now predominant across the world. England until recently was an exception to this convention. Until 1974 referees in the Football League were required to run both diagonals during a match, most opting to run from right wing to right wing in the first half before switching to the left-wing diagonal for the second half. The chief reason for this alternation was to avoid linesmen wearing down the same part of the touchline during matches – this was important given the generally lower quality of pitches at the time. However switching diagonal was also justified in terms of allowing officials to patrol different areas of the field during games. 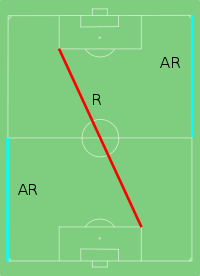 From the 1974–75 season English referees were allowed to run the same diagonal throughout the same match. Most initially opted for the right-wing diagonal although over the years the left-wing diagonal became increasingly popular and the preferred choice of most referees by the early 2000s. From 2007–08 the left-wing diagonal has been mandatory in English professional football although some referees at lower levels still use the opposite approach. Its implementation as a standard practice for referees is attributed to Sir Stanley Rous, former referee and President of FIFA from 1961 to 1974. While the Laws of the Game and FIFA mandate for a single referee with assistants as described above, a less common system, the dual system, has two referees with no assistants. The system is used some matches played under the rules of the National Federation of State High School Associations (NFHS) in the United States, and in other youth and/or amateur matches. Both referees have equal authority, and the decision of one referee is binding on the other. Each referee is primarily responsible for a specific area of the field similar to those of the assistant referees in the diagonal system, except that the referees are allowed and encouraged to move away from the touch line into the field, particularly as play approaches the goal lines. Like the assistant referees in the diagonal system, each referee is responsible for patrolling one touch line and one goal line and determining possession for the restart if the ball goes out of play on either of those two boundaries. Positioning in the dual system is similar to that used by officials in basketball: each referee is either termed the "lead" or the "trail", depending on the direction of the attack. If the attack is against the goal to the referee's right (when facing the field from his/her assigned touch line), then that referee is the lead, and the other is the trail. The lead is positioned ahead of the play, even with the second-to-last defender to the extent possible, while the trail is positioned behind the play. Both are responsible for calling fouls and misconduct and determining the restart when the ball goes out of play on one of their assigned boundary lines. Since the lead is in a better position to determine offside, the lead is responsible for calling offside, while the trail provides an extra monitor for fouls and misconduct while the lead's attention is focused on offside. When the attack changes direction, the trail becomes the lead and vice versa. Although use of the two referee system is mainly in amateur football, FIFA has experimented with it, and UEFA has lobbied FIFA to implement it at the highest levels of the game. ↑ Laws of the Game 2009/2010 (PDF). FIFA. p. 21. Retrieved 2010-01-29. ↑ "Law 9 The Ball In and Out Play" (PDF). FIFA. Retrieved 5 September 2013. ↑ "Electronic Flags" (PDF). United States Soccer Federation. Retrieved 13 May 2014. ↑ Whitwell, Laurie (8 August 2013). "Seven cameras watch like a hawk and a watch vibrates: goal-line technology is unveiled... and it's even made Arsene happy!". Daily Mail. Retrieved 13 May 2014. 1 2 Laws of the Game 2012/2013 (PDF). FIFA. p. 80. Retrieved 2013-05-20. ↑ "Story of the Referee's Whistle". Martin P Wilson. Retrieved 2012-01-30. ↑ IFAB Meeting Minutes, 1936. ↑ Laws of the Game 2009/2010 (PDF). FIFA. p. 76. Retrieved 2010-08-04. ↑ "Archived copy". Archived from the original on 27 September 2006. Retrieved 2007-04-11. 1 2 J. A. Mangan. "Sport in Europe: Politics, Class, Gender". Books.google.co.uk. p. 105. Retrieved 2016-07-18. 1 2 "History of the Laws of the Game - From 1863 to the Present Day". FIFA.com. 2016-07-01. Retrieved 2016-07-18. ↑ Rewriting the Laws of the Game (19 June 1997), also mention of the diagonal system of control for referees: FIFA.com website. ↑ Vogt, Randy (24 August 2012). "The Two-Ref System: Its Flaws and How to Cope". Soccer America. Retrieved 6 March 2014. 1 2 Yannie, Noah. "Soccer Officiating Dual System of Control" (PDF). NISOA. Retrieved 6 March 2014. ↑ "Football: The age of two referees for each match takes a step closer | Mail Online". Dailymail.co.uk. 2013-09-17. Retrieved 2014-03-07.